“It has a special place in my heart – I love it here.”æ These are the words Fed volunteer Roz Harris uses to describe her relationship with Heathlands Village. And the feeling is clearly mutual after Roz was nominated for the Order of Mercy award, in recognition of 40 years dedicated voluntary service to Heathlands Village. 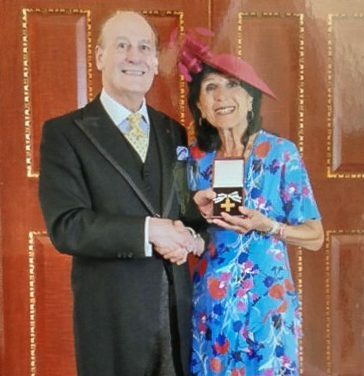 Recipients of the award, founded over 100 years ago by Royal Charter of Queen Victoria for ïvoluntary service assisting in the relief of sickness and suffering’, are nominated by charities on behalf of special individuals who have given a minimum of seven years of outstanding voluntary service. Eventually becoming Vice-Chair of the Welfare Committee in the 1990s, Roz – whoseæ husband Roy is also a Fed volunteer – was then asked by the late Dr Simon Jenkins, then President of Heathlands Village, to join the fledgling Quality Assurance Committee. As well as serving on committees and befriending residents, Roz ran the Coffee Lounge at Heathlands Village every Sunday afternoon for many years. She received the letter informing her of the award in April but did not even open it straight away! Apart from her volunteering duties, Roz has a personal connection to Heathlands Village. “My father lived here for the last 16 years of his life,” she says, “and he simply loved the place. He was so happy here – and that’s the biggest tribute to the staff I can give. Heathlands Village now is an even more amazing place than it was then. Thinking back over her many years of dedication, one event does stand out in Roz’s memory. “At the opening of Eventhall House in 1996, I met the Duke of Edinburgh. That was a real thrill, and something I’ve never forgotten. Volunteering @ The Fed – Our New Volunteers Team!